Toasted almonds, cabbage, and wontons are in charge of adding loads of crunch in this chicken salad. And when it comes to chicken, we preferred grilling it over cooking to add that perfect smoky note to the salad. Try such smart recipes to make a healthy lunch or side for special occasions. RecipeSavants.com Toasted almonds, cabbage, and wontons are in charge of adding loads of crunch in this chicken salad. And when it comes to chicken, we preferred grilling it over cooking to add that perfect smoky note to the salad. 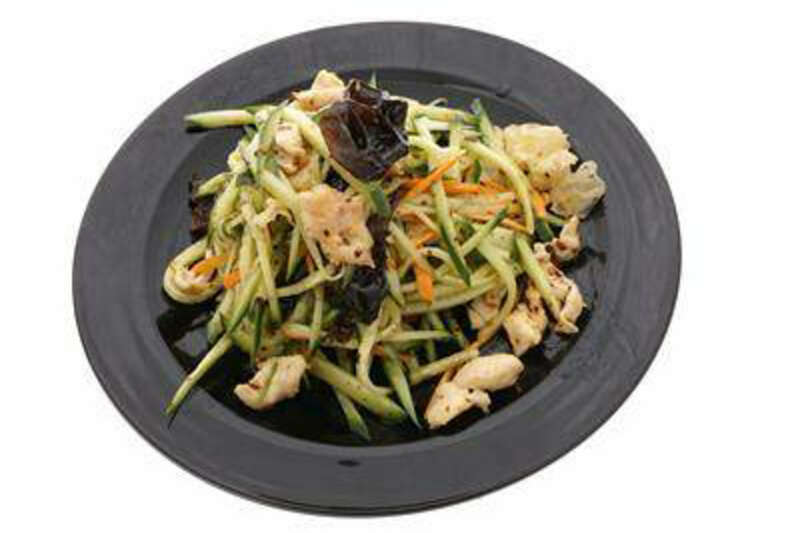 Try such smart recipes to make a healthy lunch or side for special occasions. Smart Recipes, Chinese Recipes, Chicken Recipes, Recipes Chicken Chinese Chinese Chicken Salad PT35M Serves 4 Ingredients: 2 Tablespoons Low-Sodium Soy Sauce 1 Tablespoon Fresh Ginger 1 Tablespoon Canola Oil 1 Tablespoon Hoisin Sauce 1 Teaspoon Sesame Oil 0.5 Teaspoon Sriracha 0.5 Teaspoon Kosher Salt 1 Pound Boneless, Skinless Chicken Breasts 0.25 Cup Rice Wine Vinegar 1 Pound Napa Cabbage 2 Carrots 3 Scallions 0.5 Cup Lightly Packed Fresh Cilantro Leaves 0.5 Cup Crispy Wontons 0.5 Cup Slivered Almonds 2 Teaspoon White Sesame Seeds Heat a dry frying pan over medium heat and toast almonds for about 1-2 minutes, swirl the pan continuously. Season chicken with salt and black pepper evenly. Heat a grill pan over medium-high heat and cook chicken for about 3-5 minutes per side. Remove from heat and place chicken onto a cutting board for about 5 minutes. Cut chicken into 1/4-inch-thick slices crosswise. In a small bowl, add ginger, vinegar, canola oil, sesame oil, soy sauce, hoisin sauce, sriracha and salt and beat until well combined. In a large bowl, mix together chicken, carrots, cabbage, scallions, cilantro, and half of the almonds. Add some dressing and gently, toss to coat. Add wonton strips and gently, toss again. In 4 serving plates, divide salad evenly and drizzle with dressing. Serve immediately with the topping of remaining almonds and sesame seeds.